In an unusual case, a resident of Sirhind town underwent torture at the hands of a gang of criminals for his resemblance to an alleged criminal, Hyder Ali. The gang, mistaking him for Hyder, kidnapped him to take money. While most Muslims in the area are disappointed over the Union Government’s decision to suspend transport services between India and Pakistan, there are some who say they don’t mind the decision if it means protecting the country’s honour. Continuous cold in the region for the past several days has brought cheer to hundreds of big and small hosiery manufacturers. During the past one week they have registered a massive increase in sales, that is said to be highest in the past two seasons. The existence of another syndicates in the city which forces orphaned and kidnapped children to beg has came to light with the recent arrest of four of its members by the police of division No 2. Industrialists and traders here have hailed the announcement of the Union Communication Minister, Mr Pramod Mahajan, yesterday, that the BSNL would cut down the peak-time STD rates by over 60 per cent from January 14. Eightyfive live grenades, noticed in the Sirhind river by villagers, are reportedly lying in the canal. Army personnel have not reached the place yet for clearance. 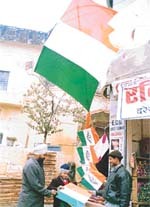 The President of the All-India Shiromani Akali Dal, Mr Gurcharan Singh Tohra, today denied that unity talks with the rival Akali Dal led by Mr Parkash Singh Badal were in progress and reiterated that there could be no unity unless Mr Badal sought forgiveness at Akal Takht and Bhai Ranjit Singh was reinstated as Jathedar Akal Takht. Grants sanctioned by the state government for rural development are reportedly being misutilised by rural development and panchayat department officials with the support of some politicians. The Nationalist Congress Party (NCP) has levelled allegations of irregularities and bungling in selection and recruitment of teachers in government-owned schools in Punjab. The board of directors, Events and Show Organisers, has decided to honour singer Ranjit Mani during a fashion show to be held on January 5, 2002, at Taksonz Party Palace, Dugri Road. A number of ex-servicemen, have offered to fight for the nation in case of war or to help the district administration in civil defence work. A solo-photo exhibition, “Europe-2001”, a collection of the photographs from India, England, Switzerland and Venice by Surkhab Shaukin Singh was inaugurated here yesterday at the Sutlej Club. Two of the photographs of Surkhab on display at an exhibition in Ludhiana on Saturday. The sports fraternity of Ludhiana district today organised a function at the conference hall of the Guru Nanak Stadium here to honour Col Raminder Singh, Director, Sports, Punjab. 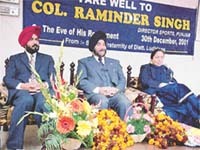 Col Raminder Singh, who had represented India in several international hockey meets, joined the Punjab Sports Department in August,1992. He would retire on December 31. Colonel Raminder Singh, Director, Sports, Punjab at a felicitation function organised by the sports fraternity of Ludhiana district on Sunday.